Ciao lovelies! 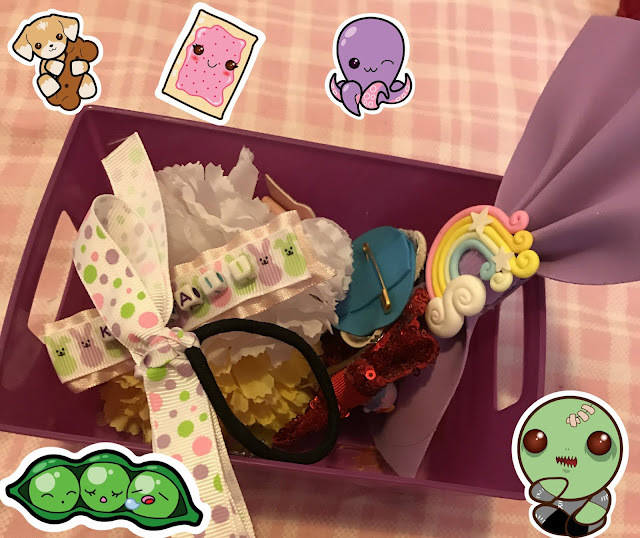 Today, we're revamping an old series and bringing you some cute DIY kawaii accessories. Kawaii is Japanese for cute, and is actually a whole subculture! Today, we're bringing back THIS and THIS post(s)! I figured, instead of Princess household items, and accessories DIYs, we could make Kawaii DIY's! 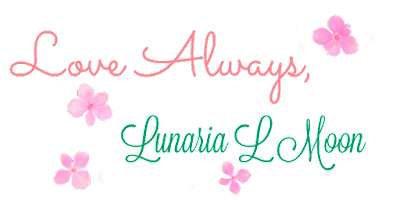 I plan on making a post for accessories (this post), school supplies, and household items- maybe more than one each! So, let's make some kawaii accessories together! To start, you'll need some bases. I'm using a couple different types of clips, hair ties, and safety pins! You'll also need the desired decorations! For the first project, we'll be making a simple flower hair clip! To do this, you need a clip like the one shown below, then hot glue fake flowers to it! Super simple! 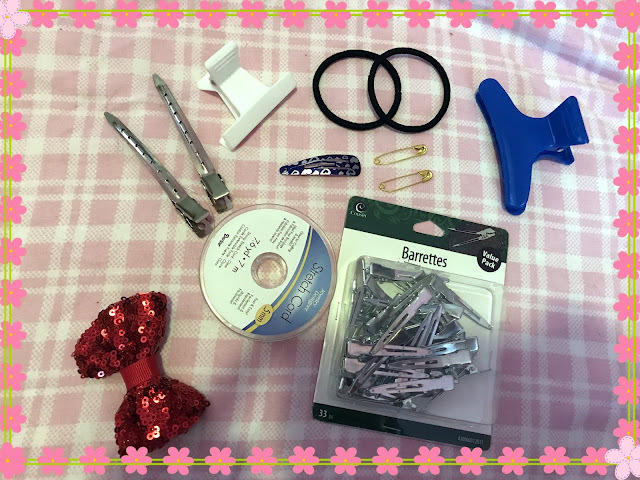 For the second project, we will be making a kawaii rainbow charm bow. For this, you'll need a rectangle of purple (or your color choice) craft foam. Fold it accordion style as shown below, then cut a long skinny rectangle of foam. Wrap this around the middle of the accordion shape and glue in place. 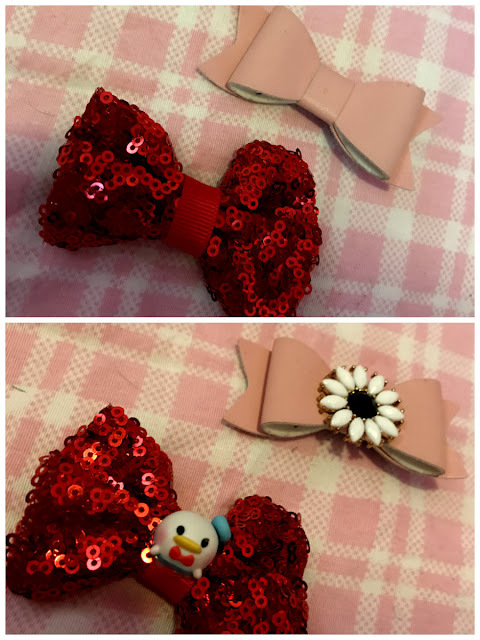 Then add a alligator clip and charm and your kawaii bow is done! 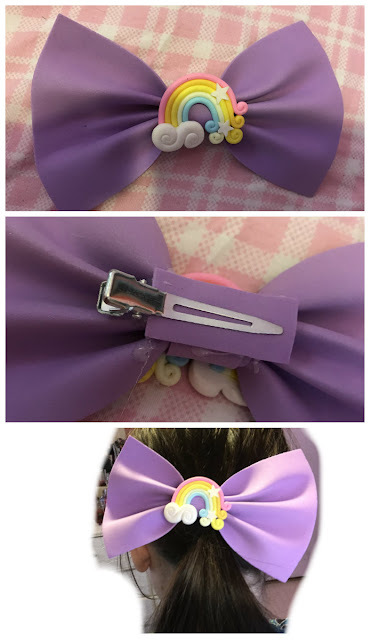 For the third project, we'll be making a some basic bows even cuter in less than a minute- by adding cute charms with hot glue! 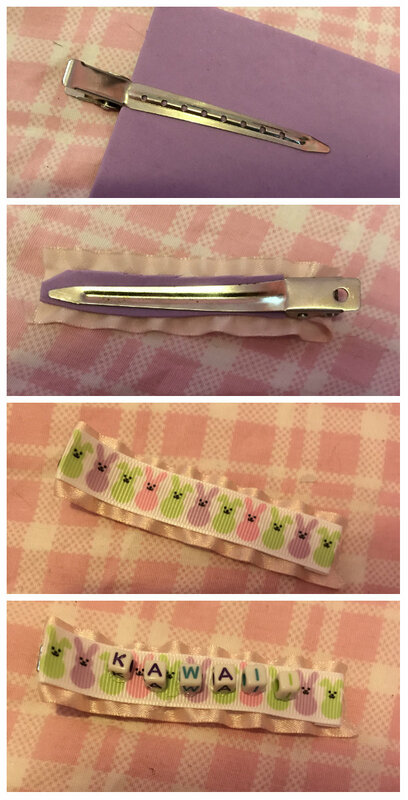 For the fourth project, we'll be making a kawaii cat face hair clip in just two steps! 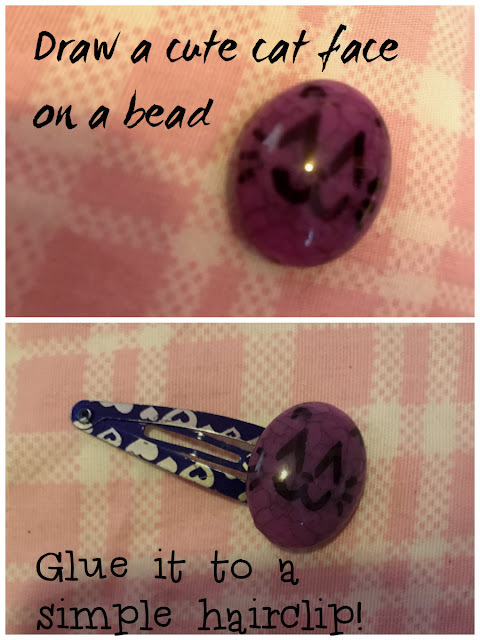 Step one- Draw kawaii cat face on a bead with a sharpie. Step two- glue kawaii cat face to hairclip! 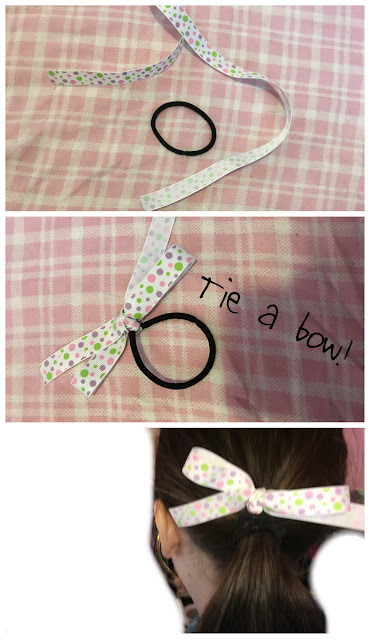 For the fifth project, we'll be making another SUPER easy one- a bow hairtie! I'm sure you can guess how we will do this. Tie a ribbon in a knot around a hair tie. Then tie a bow! For the sixth project, we will be making something a little harder. We will be making a kawaii letters alligator clip. Clip your clip onto some foam, and glue on a ruffly ribbon! 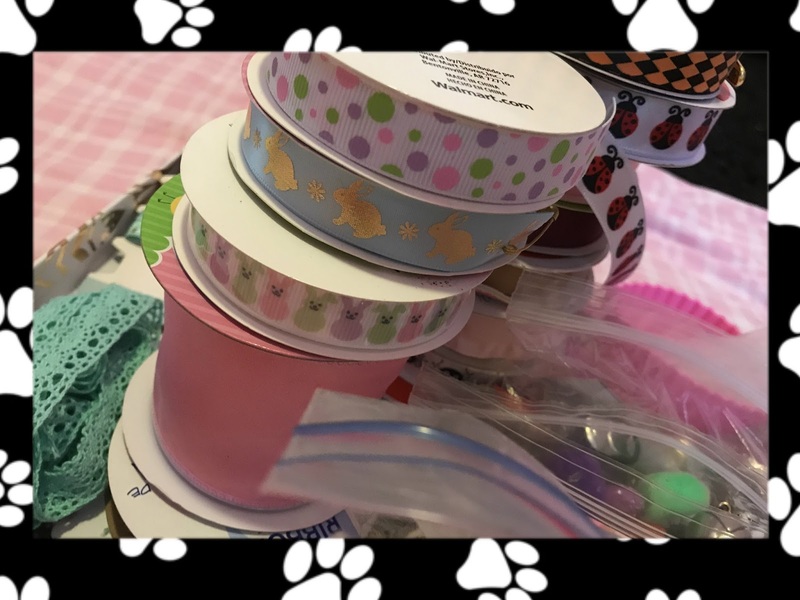 Then glue on another ribbon. Then glue on letter beads of your choice. 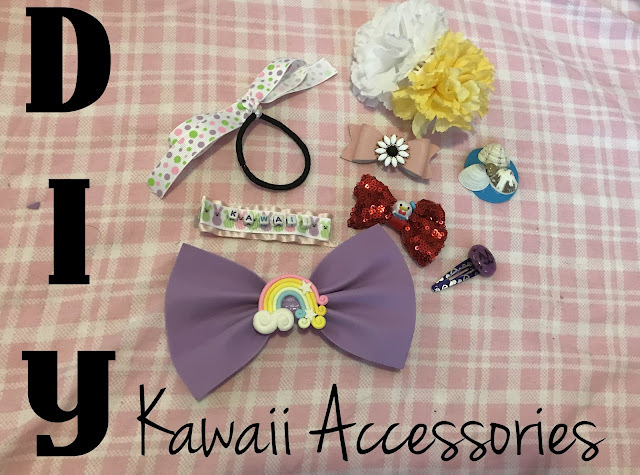 I spelled out "Kawaii" since it's the theme of this DIY list! 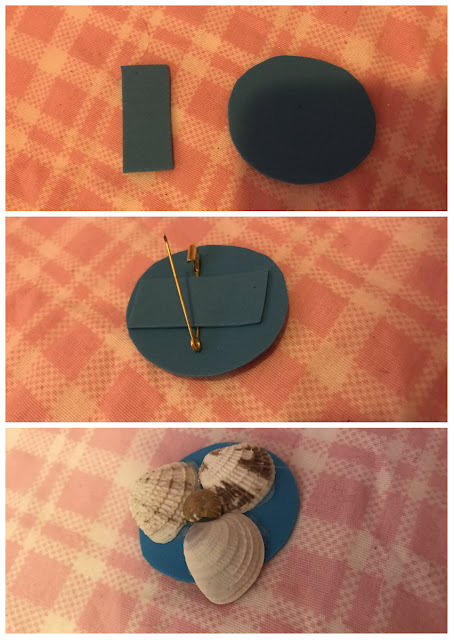 For the last project we're making a ocean brooch! Brooches are actually very easy to make if you have safety pins! You'll need some craft foam, a safety pin, and decorations of your choice. Start by cutting a circle and a small rectangle. Glue the safety pin on as shown below, then flip it over. Glue on your desired decor and you're done! These projects, while super simple, are fun to make and you can make a lot in an afternoon! Tune in next time (coming soon) where we will make a huge set of kawaii school supplies! You can get daily updates if you follow us on Facebook, Bloglovin, or even our official Instagram!